20 Slots to accommodate various PCBs that are used in a system. Slot nos. 1 to 15 and 20 are used to accommodate Non-vital or Vital I/O PCBs. Slot no. 16 & 17 are used to accommodate Power supply PCB. Slog no. 18 & 19 are used to accommodate CPU PCB. A mother board connecting all the 20 Slots. Suitable to mount on a 19” rack. Each card file to have one CPU PCB and always placed in slot no. 18 & 19. Processor used is Motorola 68332. Processor speed is 21 Mhz. 4 flash EPROMs of 8 MB to store executive and application software. Two fast Static RAM (each 64KB) to process vital data. Four Static RAM (each 64KB) to store events and errors. It has Five serial ports to communicate with peripheral devices. Port 1 & 2 are RS 485 type for Vital control systems such as MLKII. Port 3 is RS 432 type for other Non-vital control systems. Port 4 is RS 232 type for other Non-vital control systems. Port 5 is used exclusively for Diagnostic purpose. 1. Power supply PCB is basically a DC-DC converter that converts 12V DC input supply in to +12V, -12V and +5V required for various board functioning. 2. 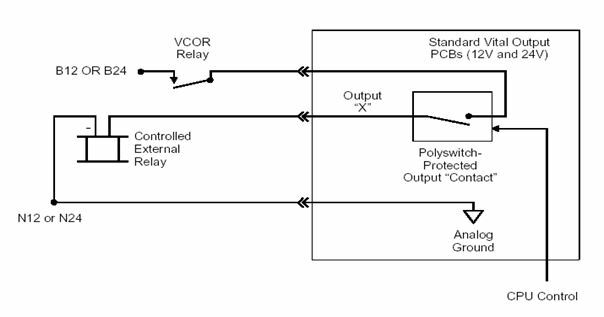 Based on diagnostic check by CPU, PS PCB receives 250 Hz signal from CPU and extends supply to VCOR relay. 3. Provides isolated supply to internal circuit. Each Vital Output PCB has 16 Outputs. Suitable for 12V and 24V DC application. 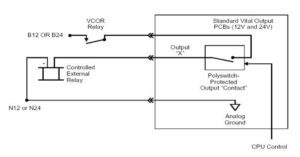 Each Vital Output can drive an output device such as any Q-Series relay. 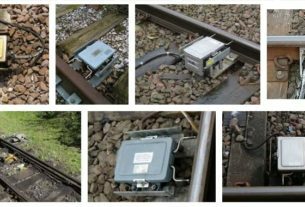 This output relay in turn controls signals, points, crank handle, siding control, level crossing etc. 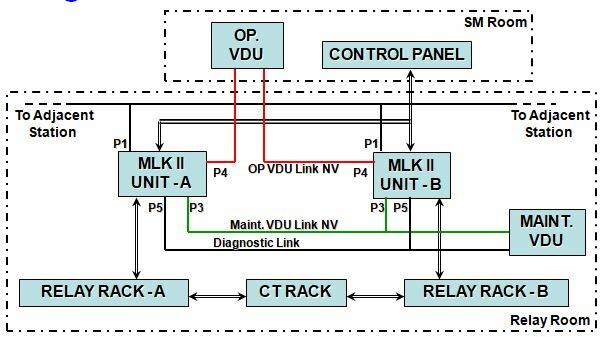 Since Vital Output drives the relay which controls important out door gears, all the Vital Output boards are continuously diagnosed by a CPU. 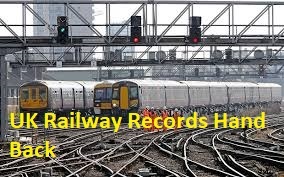 Any abnormality in any of the outputs will shut down the system to ensure safety. The status of Vital Output is known from LEDs available in front of the PCB. Each Vital Input PCB has 16 Inputs. 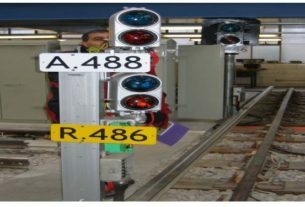 Each Vital Input is assigned to read the status of out door gears such as Track circuits, Point detections, Crank handles, Siding controls, level crossing etc. Since the Vital Inputs read the status of out door gears, they are normally configured with double cutting arrangement using relay contacts. The status of Vital Input is known from LEDs available in front of the PCB. Each Non-vital I/O PCB has 32 inputs and 32 outputs in one PCB. Suitable for 12V or 24V DC application. Non-vital inputs are Panel push buttons and keys. Non-vital outputs are Panel indication LEDs, counters and buzzers. The status of Non-vital Input/Output is known from LEDs available in front of the PCB. Each Card file will have one VCOR to ensure the healthiness of the system. VCOR has 6 F/B dependent contacts each rated for 3 Amps. When system is healthy, the coil receives voltage from PS PCB which in turn controlled by CPU. Power to Vital Output board is controlled by VCOR, thus ensuring safety. 48 Pin Address select PCB and Connector assembly for Vital Input and Vital Output cards. 96 Pin Address select PCB and Connector assembly for Non-Vital I/O cards. 48 Pin Connector Assembly for PS and CPU PCB. EEPROM PCB to configure various serial communication ports. Keying plugs to ensure coding of each type of cards. Used to address particular slot of the card file. Each address select PCB consists of 6 nos. of Jumpers. These jumper settings are unique and shall match with the definition of cards in application program. 48 Pin address select PCB is used for Vital Input and Output boards. 96 Pin address select PCB is used for Non-vital I/O boards. Each connector assembly consists of connector receptacle (i.e cover), guide pair to fix the connector on the card file & crimp contacts. Connector Assemblies are used to connect MLKII cards with Relays, relay contacts and panel with help of pre-wired cables. The 48 Pin connector assembly is used for Vital Input and Output boards. The 96 Pin connector assembly is used for Non-vital I/O boards. The EEPROM PCB is placed on the 48 Pin connector assembly of the CPU PCB. The purpose of EEPROM PCB is to store Site specific configuration data. The purpose of the keying plug is to avoid insertion of wrong type of board in card file slot. Each slot requires 6 Nos. of keying plug and to be inserted according to type of the board. In principal Keying Plug is similar to the index pin of relays. 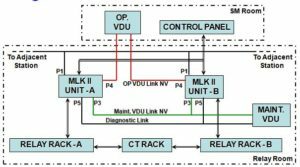 The information gathered from “Signal Interlocking Plan” and “Front Plate Drawing” is used to calculate Vital I/O and Non-Vital I/O respectively. Place maximum of 16 nos. of either Vital or Non-vital cards per Cardfile. Arrive at final quantity of cardfiles. On the basis of requirement of installation / site, MLK II is connected with the peripheral equipments such as VDUs and another MLK II units. All the peripherals are connected with MLK II with serial communication cable. I/O from / to control panel are connected through multi core cables.